Imagine that you are creating a digital marketing plan for the year. Which of the following goals sounds like it will actually motivate your team to successfully execute the plan? This was the main question I set out to answer when I interviewed Tom Shapiro, CEO of Stratabeat and author of the new book Rethink Your Marketing. Tom wanted to share the lessons he has learned from working on digital marketing with hundreds of companies over the past 20 years. In the book, he discusses 7 places that companies should investigate when they want to break through their current revenue ceiling to unlock new growth. He encourages marketers to rethink their audience, methods of communication and persuasion, marketing mix, metrics, revenue model and future industry growth. But the first chapter he wrote was on goal setting. He frequently found that marketers would fail to grow the business because they set the wrong goals or had the wrong goal management framework in the first place. So I interviewed him to learn what was going wrong, and how to fix it. And by the way, in the question above, the second goal setting method is far more likely to encourage goal achievement. He digs into goal-setting strategies that marketers can use to motivate the team. Kevin (K): Do you more commonly see that people set too many goals or too few goals? Tom (T): It is far more common for marketers to not set enough goals, and for the goals to be too vague. Vagueness is a growth killer. If you have well-defined, specific goals, everybody feels empowered and energized. They will put all their resources into achieving those goals. Typically, when we meet with a client at Stratabeat, the very first conversation we have centers around goals. We have to know the goals in order to understand what the strategies need to be. Typically we will ask, “What are your marketing goals?” and the response might be “Oh, we need to increase revenue” or “We need to increase sales on this new product” or “We want to increase sales in this geographic region”. That is too vague. If we increase sales by 1%, is that a huge success? Typically, they say “Of course not!” So then what exactly is the goal? Driving marketing leaders towards a specific definition of success is really hard, because many will hesitate. I believe it happens because people are risk averse. If you work at a mid-size or Fortune 500 company, you don’t want to lose your job. So, how do you make sure that you keep your job? You make sure that nobody can pinpoint failure to your efforts. When you set vague goals, nobody can blame you for missing them! We see that a lot. It is challenging. We press and press, and even then companies may be unwilling to be specific with goals. We still need to press. Typically, they have not thought through their goals to that level, and therefore we find it really helpful to go through a prioritization process with clients. So, not only do you have goals established, but you have them prioritized clearly, as well. K: When marketers do not set goals, they cannot fail. That sounds like a pretty good deal! Does it come back to bite them later? T: It does come back to bite them. It might not be obvious to the executive management team, but it will come back to get them. Goals compel action. If you break them down into achievable SMART goals as stepping stones to achieve the larger goals, you can achieve tremendous growth. If you are very vague about everything, and if you are unwilling to commit to specific goals, it makes it hard to leverage all of your resources and maximize the power of your resources towards achieving the goals. Here’s the thing- if you want to unleash growth, you need to go bold and go big. You need to be very clear about what you are trying to achieve. Just trying to tinker around the edges doesn’t work. I have seen it over and over. It might seem like it is beneficial to the employee to keep things vague, but it is really to their advantage to be held accountable. Then, they have the opportunity to achieve amazing success, blast through their goals and receive credit for it. K: So when do marketers learn that they probably should have set different goals? Is it a year in the future at the next annual review? T: There is a whole other part of goal management- tracking, reporting, and analysis. You want to have multiple layers of data available at your fingertips that you can review consistently. You want to have a dashboard that you can reference on a daily or near-daily basis. You want to do analysis on a weekly or monthly or quarterly basis. It all depends on what level of goals you are talking about. For example, a marketing department may have overarching goals like increasing revenue by 15% within 6 months. Then, you can break that down so that progress is being reviewed on a weekly or monthly basis. At Stratabeat, we have weekly, monthly and yearly goals. The cadence of reviewing your goals depends on the timeframe for those goals. K: What are some common signs that the team is being handicapped by setting the wrong goals? T: Goals need to have the proper infrastructure in place. You need to have the right tools, technology and timeframe. You also need the right staff and resources. And the budget needs to be sufficient to support the goals. You also have to be careful about tinkering at the top. Let’s say you are a midsize company, and the entrepreneur is still the CEO. We often find that the entrepreneur-CEO will have an entrepreneurial mindset rather than an execution mindset. They love new things all the time. They bring up new ideas every month or every quarter. The company’s goals change every quarter or every 6 months. This demoralizes the team. You set doubts in minds, because when you come up with a new goal, they don’t know whether to take it seriously. They don’t put the same level of effort in. Looking at the infrastructure is important, but also the leadership needs to stick to the goals like glue. K: What is the difference between SMART and stretch goals? What do people get wrong when they just set SMART goals? T: SMART goals are fantastic. For anyone that is unfamiliar, a SMART goal is one that is specific, measurable, achievable, relevant and time-bound (it has a deadline). If you want to achieve breakthrough success, unleash revenue growth or 10x something, though, that is not a time for a SMART goal. SMART goals are great if you want to achieve smaller goals or goals that build up to larger goals. If you were using SMART goals, the project leader would have said, “Okay, that is achievable. Which SMART goals will help us achieve that?” And they probably would have achieved it. With a stretch goal, you don’t know how you will achieve it yet. You know what you are aspiring towards. You start by breaking it down into chunks or components. Then, you set SMART goals for each component. As you progress towards that larger, more ambitious goal, you are more likely to achieve it. As Duhigg explains in his book, you can use SMART goals as enablers for stretch goals. K: I know that you feel three goals is the ideal number. How did you realize that? The more that I read about goal theory and goal management, the more that I realized that this is common among high achievers. Journalists often asked Steve Jobs about focus, because when he came back to Apple, the first thing he did was eliminate products. He eliminated most of their products, in fact. He narrowed it down to a select few. When interviewed, Jobs said that people get focus all wrong. It is not about what you are focused on accomplishing, it is about the hundreds or thousands of things that you are going to say ‘no’ to. Few people are good at saying ‘no’ to many options. Steve would force teams to narrow it down to three goals. When Mark Parker took over as CEO of Nike, Steve Jobs called to congratulate him. He asked Steve if he had any advice. Steve initially said, “Oh no, no advice at the moment.” But then he said, “Well, just one thing. Nike makes some of the best products in the world. Products that you lust after. But you also make a lot of crap. Just get rid of the crappy stuff and focus on the good stuff.” Mark was waiting for laughter after. Steve did not laugh. If you look at Warren Buffett’s ideas for goals setting, he recommends that you set 25 goals to start. Then, you choose your top 5 highest priorities from those 25. Then you delete the other 20. So you don’t have a long to-do list with 5 priorities. You delete the other 20 and stop thinking about them. Narrowing focus helps you achieve more. Jim Collins, the author of Good to Great, says that if you have more than 3 priorities, you have 0 priorities. K: Do you have any advice or formula for linking the three goals? Or is it customized for each individual situation? T: Goals have to be customized in every case. But goals do not mean anything by themselves. You also need to have strategies that support those goals. You need a framework to execute the strategies. Some marketing teams have 3 people, others have 30, and others have 300. You have to customize goals in each case. If you take on a 10x goal, your strategies need to be equally ambitious. If you say that your annual goal is to grow organic traffic by 20%, you will not need strategies as ambitious. For example, we had a client that really wanted to do inbound marketing to generate leads. They had very specific goals around lead generation. Here was the challenge- they needed leads immediately. They needed to prove to investors within a month that their marketing efforts led to growth. It was a very short leash. But, then they started talking endlessly about inbound marketing. Inbound marketing is amazing, but it is long term. If you need leads today, you wouldn’t want to start doing inbound and expect immediate results. For them, customizing the strategies meant that we needed to do a lot of paid media. That way, we could get leads immediately. But, they only wanted us to do inbound marketing. We eventually had to part ways with them because they did not understand that the strategy needs to directly lead to the achievement of your goals. Even if you have well-defined goals, if the strategy does not make sense, you are still setting yourself up for failure. K: Any other keys to goal achievement? T: Let me point out some research from Heidi Grant Halvorson. She points to feedback loops as a big factor in goal achievement. You need to have a feedback loop with data coming back to team members so they know how much further they need to go. They need to know the delta between where they are currently and where they need to be at the finish line. This ties into neuroscience because the brain actually jumps into action and throws resources at this discrepancy. If your goal is 100 leads a week and you are generating 80 leads a week, you know that you are 20 leads away. By having this data at your fingertips, it organically triggers the brain to throw more energy at the problem. The brain automatically tries to do deeper thinking to solve the problem and overcome that delta. Without the frequent cadence of seeing the data, analyzing the data, and figuring out next steps, it is very hard to achieve your goals. If you want to create goals within Databox, you can set them here. They can be set on any specific metric that drives your business and for any timeframe. We recommended monthly goals. Want to check out the full book? 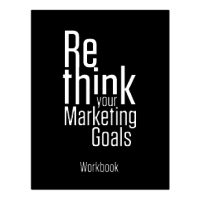 Head over to Amazon to read Rethink Your Marketing. Or, download the Goal Achievement Workbook to start setting goals now. Set your goals with the same formulas that the experts use. Make sure your whole team understands your plans.